Cystic fibrosis is a very serious disorder that causes respiratory issues and digestive problems. 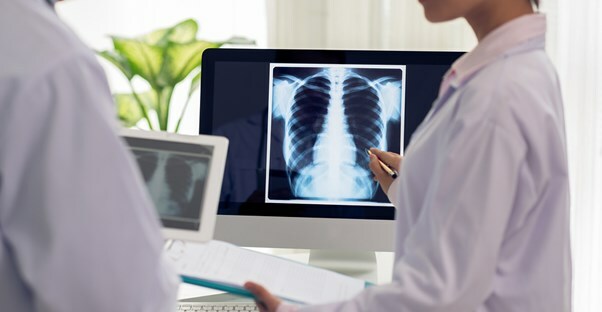 Although cystic fibrosis (CF) was once a death sentence, new medical breakthroughs allow those with the disease to live much longer, fuller lives. Here’s a look at the genetics behind the cause of cystic fibrosis and those more likely to develop it. CF develops when two people carry a defective gene and both pass it on to a child. The result is improperly functioning secretory glands, those responsible for producing digestive juice, mucus, and other bodily secretions. Mucus is often too thick and doesn’t move through the body’s tubes and pipes the way its supposed to. For example, the lungs hold in too much mucus, which leads to coughing, wheezing, and difficulty breathing. In the digestive system, there is a tube that delivers an enzyme produced by the pancreas to the small intestine that breaks down nutrients so it can absorb them. When too much mucus builds up, the enzyme can’t be delivered, and essential nutrients aren’t recieved, preventing growth and weight gain. According to the Cystic Fibrosis Foundation (CFF), at the root of all this is the CF gene's production of the CFTR (cystic fibrosis transmembrane conductance regulator) protein. Properly functioning CFTR protein allows the produced secretions to move across surfaces and gets mucus out of the way. When CF is present, however, CFTR is either not produced or simply doesn’t do its job. Surfaces and tubes become dehydrated, mucus gets thick, and begins to stop up tubes and airways. In turn, all the mucus holds in bacteria and clogs the natural flow of things, damaging passageways and causing infection. CF knows no ethnic bounds. Although it can appear in any race, it is most common among white Northern Europeans. Because of its genetic cause, this makes it most likely to develop in someone who has a family member with CF. Unfortunately, because the risk factors are purely hereditary, this makes it virtually impossible to prevent CF. It is possible, however, for prospective parents without CF to get DNA tests done to see if both of them carry the defective gene. Both parents must carry the mutated gene, of which there are more than 1800 different types. However, even if they do, there is still a chance they can have a healthy baby. Regardless, it can be helpful to be informed and prepared before conception.